Today’s Flash Back Friday comes from Episode 110, published in October 2012. Throughout our life, we often experience “aha” moments of truth and clarity, but why don’t those moments of clarity last? 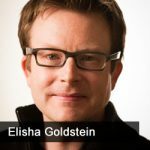 In this 10th show, Jason Hartman’s guest, Elisha Goldstein, PhD, author of The Now Effect: How a Mindful Moment Can Change the Rest of Your Life, explored the reasons and asked the question, “What if an awareness of that space, that moment, could change the rest of your life?” Elisha explains that what we practice and repeat becomes habit. Our brain is wired to routine and to the negative. By becoming aware of automatic thoughts and processes, we can stop them and make different choices. The space in which this awareness happens, Elisha refers to as “choice points.” Practicing and repeating new and positive choices, such as compassion and kindness, creates new habits of thinking. Elisha elaborates on how this process works in the brain. He also discusses intuition and provides some basic practices to help rewire our brains to make our intuition more reliable, to make better choices, and how to become grounded in the here and now and learning to recognize the good in any given moment. For more details, listen at: www.HolisticSurvival.com. Dr. Goldstein, who comes from a family of psychologists, advocates that mental health comes from an approach that looks at all aspects of the self – physical, mental, emotional and even spiritual. As a licensed Psychologist, he teaches mindfulness-based programs in his own practice and through InsightLA. He has spoken at the UCLA Mindfulness and Psychotherapy Conference headlining Thich Nhat Hanh, Daniel Siegel, and Jack Kornfield, The NICABM Conference, Psychotherapy Networker, FACES Conferences, UCLA Semel Institute and Anxiety Disorder Clinic, the University of Washington with Dr. Alan Marlatt, and often hosts daylong courses atUCLA Extension. He is author of the popular Mindfulness and Psychotherapy Blog on Psychcentral.com and writes for the Huffington Post, Mindful.org and Mentalhelp.net. He has designed the 12-week Mindfulness at Work™ program that is currently being conducted in many mulinational corporations and has been published in The Journal of Clinical Psychologyand quoted in the New York Daily News, Reuters, NPR, UCLA Today, Examiner.com,Beliefnet.com, Body & Soul, The Week Magazine, among others. In addition to his books, he has created popular CDs and MP3 albums including Mindful Solutions for Stress, Anxiety and Depression, Mindful Solutions for Addiction and Relapse Prevention, Mindful Solutions for Success and Stress Reduction at Work, and Mindful Solutions for Adults with ADD/ADHD.